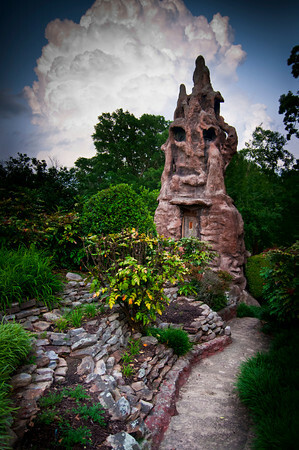 When I visit Memphis, one location I enjoy photographing is the Crystal Grotto. Located within the Memorial Park Cemetery. Yes, in a cemetery. 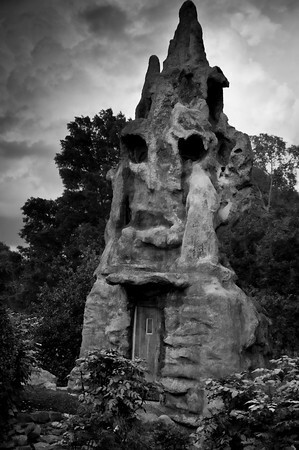 This image looks like something from a theme park but it is from a cemetery. On this trip, I didn't have much time before it was dark and I was attempting to get a unique sunset. However, the sun kept moving behind the clouds and I decided to turn around and I noticed this amazing looking scene. Typically, I would put on a circular polarizer to bring in the clouds. However, I did not have time and I exposed for the sky/clouds and underexposed the subject. I wanted the clouds to accent this great looking scene. Since I shoot in raw, I was able to bring up the exposure in the main part of the scene while keeping the detail of the beautiful sky. This type of scenery helps create very unique looking images when used as a base for portraits. I can image a couple standing on the walk with the beautiful sky as the backdrop to an eerie scene. Convert this scene to a black and white and the mood changes. Darken the image more, place a subject near the door with a small amount of light on their face and the scene changes even more. I can image many different light and scene combinations for this one setting. This image looks as if it is a very scary image from a horror film or children's adventure story. My hint and suggestion for today. Turn around and look at each scene in a different manner. In this case, I was looking for a sunset but found unique lighting angles for this amazing setting. When you see a beautiful sunset, turn around and look where the light is falling. You might find an interesting view that you never noticed before. 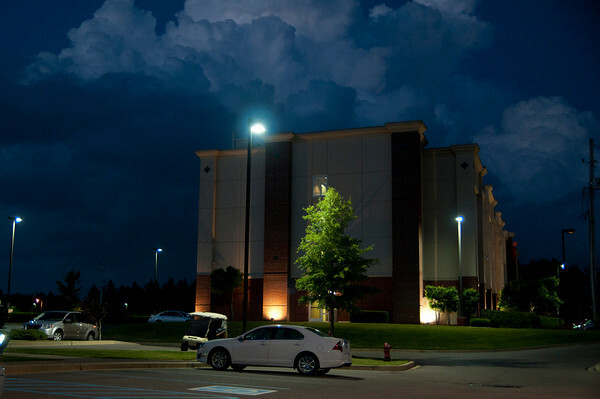 In this final image, I pulled into the parking lot of the hotel and turned around to see this beautiful twilight image. Very little modification was done in the computer for this image. The skies were amazing. As always - get out and enjoy the beauty of life!